Neil Morgan began life as Skegness United manager with a 3-0 defeat at home to Cleethorpes Town’s Development Squad on Saturday. Morgan - who took over the role from Gary Edgeley earlier in the week - found himself up against an experienced Cleethorpes side which included a number of first-team players returning after injury. Ross Muirhead returned to the Skegness starting line up following a number of weeks unavailable. However, the match may well be remembered for the quality of the refereeing rather than the football. In the opening 15 minutes there was little goalmouth action and the game was played mainly in the midfield although the visitors had the greater control of the game. United’s first chance on goal came on 20 minutes from a free kick taken by Nathan Wetton which found Alex Kendrick. However, his shot was over the bar. In the next minute it was the turn of Cleethorpes, Jack Barlow bringing out a good save fromn Travis Portas, who then turned another strike round his post. The game continued to half time with Cleethorpes holding the upper hand. Danny Reid worked hard up front, but with little support he found it hard going against the central partnership of Ballard and Wressel. Most of the United attacks came down the left with Kyle Howitt and Wetton linking up well. United went in a half time on level terms after good defence work by Ross Muirhead, Alex Simpson and Jake Portas. The game changed 10 minutes into the second half with a penalty awarded to Cleethorpes following a tackle by Muirhead, which appeared to be a ball-winning challenge outside of the area. From the spot Reece Newell put the visitors ahead. United had their best chance of the game when Harry Ginniff was played through, but his strike went wide of the far post when visiting keeper Thomas Cooke advanced from his line. 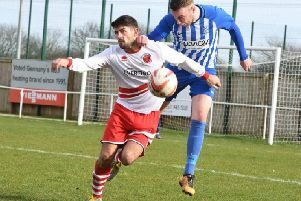 The visitors doubled their advantage when Barlow cut in and squared the ball for Gary Nimmo to finish from 10 yards, despite Skegness protestations of a foil in the build-up. Cleethorpes’ Danny Durosemo was then sent off for what both sides believed was a nothing incident. On 75 minutes Town scored number three when Jacob Wilson fired home a loose ball. In the final 10 minutes United had their best spell of the match, creating a handful of chances. Jake Portas’ header was the best opportunity, but the ball was gathered by Cooke. On Saturday United travel to face Cleethorpes Town DS again, this time in the Supplementary Cup (KO 1.30pm). Saturday’s result leaved United in eighth place in the Lincolnshire league. They sit eight points behind fifth-placed Brigg with three games in hand.